Acupuncture is an important part of Chinese medicine. It was initially invented as a medical treatment technique and gradually became a science. The science of acupuncture aims to record its technique, clinic regulation, and basic theory. Acupuncture has a long history. In ancient books, the tool for acupuncture was recorded as being made of stone. Such tool appeared between 4,000 to 8,000 years ago, which was the later part of the clan society, according to archeological excavation. In theSpring and Autumn Period(770-446BC), medicine shifted away from sorcery and some doctors arose. In the book, Chun Qiu Zuo Shi Zhuan, Doctor Yi Huan mentioned about acupuncture andmoxibustion(ancient form of heat therapy) when treating Duke Jing of a disease. From theWarring States Periodto theWestern Han Dynasty(475BC-24AD), there were more and more needles made of metal with the development of the iron-smelting technique at that time. Needles made of metal could reach the parts of the body which the needles made of stone could not, thus further improving acupuncture. In the EasternHan Dynastyand theThree Kingdoms Period(25-280), there appeared many doctors good at acupuncture. Zhen Jiu Jia Yi Jing, written by Huang Pu Mi, was the first book to discuss acupuncture systematically. More and more books on acupuncture were written in the Jin and theNorthern and Southern dynasties(265-589), when acupuncture was introduced to Korea and Japan. In the Sui and Tang period (581-907), acupuncture became a specialized subject. In the medical educational institutions, it was set up as a major. 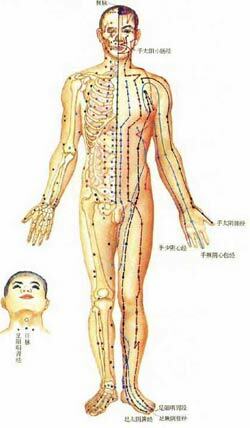 In the 16th century, during theMing Dynasty(1368-1644), acupuncture was introduced to Europe, yet it experienced a setback in theQing Dynasty(1644-1911) when it was not highly regarded. After the establishment of thePeople's Republic of Chinain 1949, acupuncture has seen great progress. Currently, acupuncture sections were set up in all Chinese Medicine hospitals, which now number 2,000 all over China. It now can be applied to different systems inside the human body. In addition, much valuable information have been obtained in the study of acupuncture, in its regulative function, in easing pain, in developing the immunity system, and in the study of human channels, acupuncture points, and internal organs.